When it comes to unpleasant characters, you would have to go a long way to find one to equal Jack Manningham. Richard Neal must have turned himself inside out to portray this cold, manipulative man who slowly convinces his wife Bella (Tracey Nicholls) that she is going insane. At first appearing to be trying to help and understand her, it was soon clear that in fact he was undermining her with every word and action. Tracey Nicholls never disappoints and in this role she took advantage of every opportunity to show her sadness and despair as her life appeared to be going in a downward spiral. 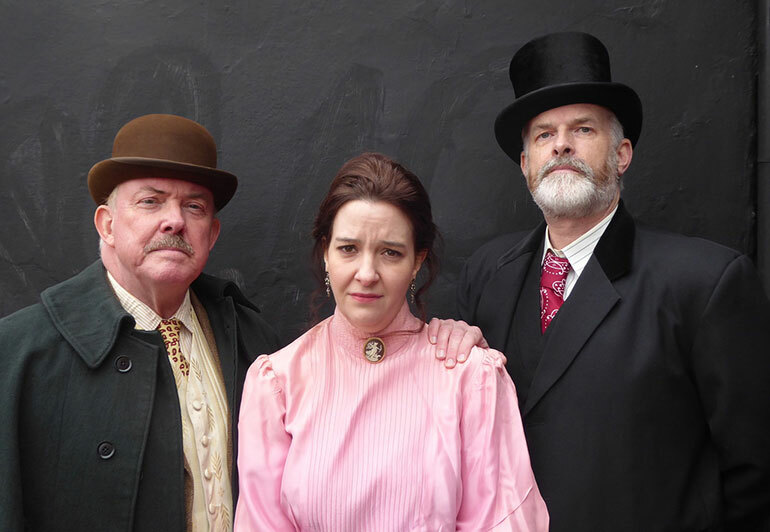 The term ‘gaslighting’ – which has become familiar recently with the Metoo movement – originated from this play, which is set in Victorian London. Bella is told by Jack that the gaslights dimming in the house are a figment of her imagination, when there is in fact a real reason for them to do so. Chrissie Neal was sensible and measured as Elizabeth the housekeeper, whilst Jemma Cable was suitably flirty and impudent as Nancy the maid. Chris Durham looked thoroughly as home with his portrayal of the kindly, but efficient Inspector Rough, who reassured Bella that there was nothing wrong with her sanity and that her husband was in fact a cruel killer and a thief. The final scene sealed his fate. Two police officers (Gary Paine and Richard Scotson) arrested Jack and tied him to a chair, giving Bella the chance to taunt him and to realise that she was now free – and perfectly sane. Directed by Sam Moulton, this was another very professional production by this talented drama group who never have any problem with filling the Tivoli Theatre for four performances.